Heavy rains are about to fall over the lush mountain range that houses the cave, adding urgency to the rescue. 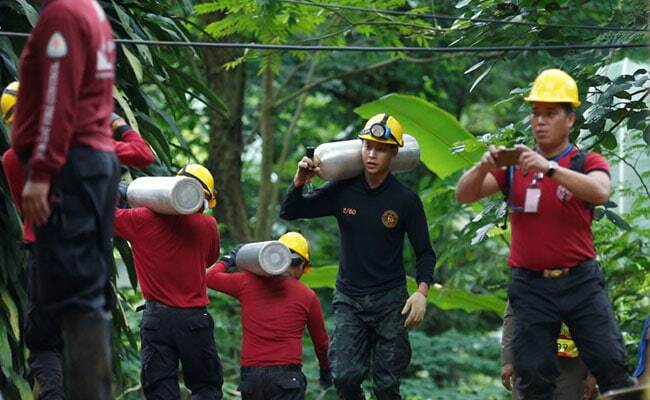 Four members of a youth soccer team were rescued Sunday from a cave complex in northern Thailand where they had been stranded for more than two weeks, according to the provincial governor. The four were checked out in a field hospital near the cave and then helicoptered 37 miles south to a hospital in Chiang Rai, where an entire floor has been reserved for the rescue effort, said Narongsak Osatanakorn, the outgoing governor of Chiang Rai province. 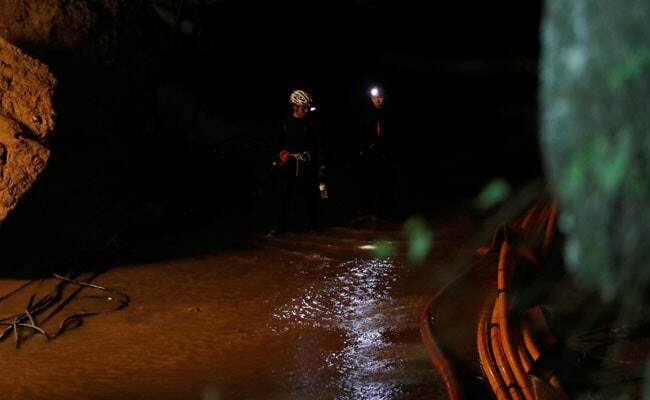 More rescues were expected for the eight remaining players and their coach, who have been trapped since June 23 by floodwaters in a dark, six-mile-long cave system. Because all the rescue equipment was used up in Sunday's attempts, the next push would have to wait until Monday morning, Osatanakorn said. 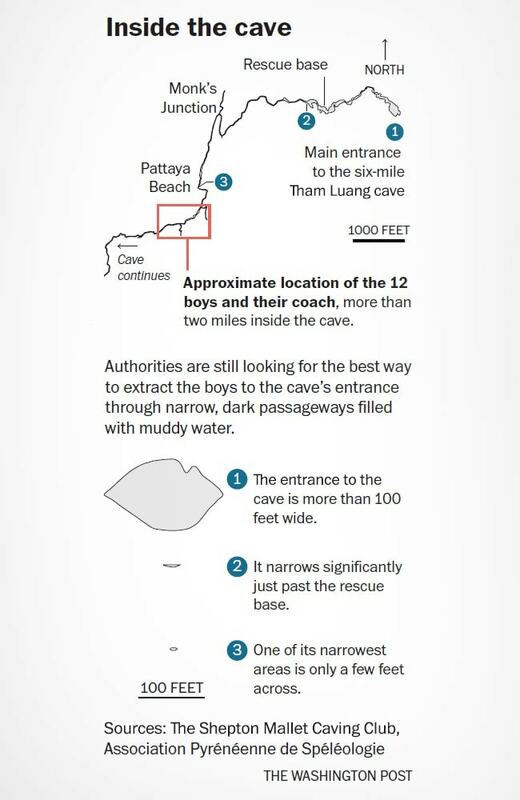 According to a graphic released by the Thai government, the plan is for two divers to be paired with each person being rescued, who will be fitted with a face mask connected to a compressed air tank. At especially narrow parts of the cave, the tanks will be released from their backs and rolled instead. Divers launched a daring and dangerous mission to free the children and their soccer coach. Officials have said that conditions are as perfect as they can be. The water levels in the cave are the lowest they have been throughout this mission, and the first few chambers that the group will have to pass through - all of which were flooded days ago - are now dry. Oxygen levels, too, have stabilized following fears that the chamber the group was in was filling with carbon dioxide from members of the large rescue operation. "The kids are so strong, physically and mentally," Osatanakorn said. Their health has been assessed in the cave by an Australian doctor. But experts have warned that extraction efforts will bear significant risk, underscored by the death of a retired Thai Navy SEAL early Friday when he ran out of oxygen during a dive. He was placing compressed air tanks along the exit route when he fell unconscious and died shortly after. 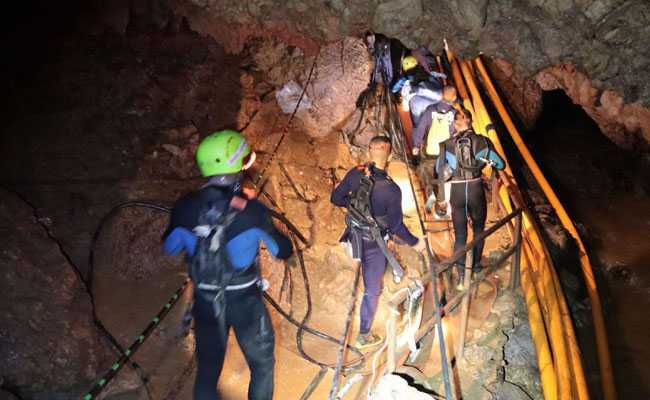 This risk remains for the team, which could run out of air supply before reaching safety, said Tony Haigh, a spokesman for the British Cave Rescue Council, two of whose members were the British rescue divers that first found the boys. The other risk is becoming trapped by an obstacle they cannot see because the divers' field of view will be limited in the muddy, brown water. "Clearly there is a huge risk of someone panicking if they are not used to the diving environment. It happens to adults in the open water, never mind children in a dark cave," Haigh said. None of the boys can swim, but they have been given extensive diving lessons since being found. "I've no doubt some will be more apprehensive than others." The young soccer players and their coach were trapped when monsoon rains flooded the cave while they were exploring. The group was found in a small cave chamber Monday - after nine days - launching an international rescue effort of more than a thousand people. The international team of divers assisting the effort are from the United States, Australia, China and Europe. It includes British divers from the rescue group that first found the team huddled together Monday night. President Donald Trump said on Twitter that the United States is "working very closely" with Thai officials. Authorities for days had been stalling on a firm decision on the best path forward to extract the boys and their coach. Late Friday, Narongsak acknowledged that all options appeared too risky and that officials were looking for backups to the dive, spooked by the SEAL's death. Authorities said efforts to drill down from the top of the mountain have been unsuccessful, with only 18 workable openings. Impending rains made that option less viable, as it would take too long. Narongsak said that rescuers have assessed the boys' condition and also briefed their families, who are aware and supportive of the rescue plan. Officials have been racing against the clock to get the boys physically strong enough and mentally prepared for a journey that will probably take at least five hours. "They are ready in every way," he said. The boys, aged between 11 and 16, went missing with their 25-year-old coach. Before the rescue attempt was announced Sunday morning, ambulances were seen zipping up a muddy pathway to take their stations. Officials moved the large media contingent away from the rescue site to make way for those working directly on the extraction. They have not specified how the boys would be transported from the cave's entrance when they are freed, but several helicopters have been on standby for days, prepared to bring them to the hospital for treatment. The drama of the rescue, with all its peaks of euphoria and lows of anxiety, has gripped the world, prompting experts from all over to weigh in on possible extraction methods that would minimize risk to the boys. SpaceX CEO Elon Musk said on Twitter that his team was working on a child-size submarine pod that would be "small enough to get through narrow gaps." It was unclear whether his method would be ready in time or used by Thai officials. Mental health and medical experts have warned that even if the whole team gets out safely, they are likely to battle weeks, if not months, of mental and physical traumas. Officials had said earlier that three in the group, including the coach, were weak and malnourished. Mental health effects could include depression, anxiety, anger and an inability to adjust to normal sleep patterns, said Jacob Hyde, an assistant professor of military psychology at the University of Denver who studies reactions to isolated, confined environments. The group's camaraderie and Thailand's cultural context, however, would probably help them after the ordeal, he said. "Cultural factors have and will continue to come into play here," Hyde said. "If this were a group of boys who didn't know each other and were trapped in this cave, the process and outcomes would likely be quite a bit different." The assistant coach with the boys in the cave, Ekapol Chanthawong, has been using his experience as a novice monk to help the team stay calm through meditation, officials and parents have said. The coach and the boys have been communicating with their parents through letters, telling their loved ones not to worry and specifying their most pressing food cravings. "If we can get out, please can you bring me to eat at the pan-fried pork restaurant?" one of the boys wrote in a letter published on the Thai Navy SEALs' Facebook page. "I love you." In another post on the Facebook page, the SEALs said their group was united in bringing out the Moo Pa, or Wild Boars, posting the message with a photo of three people gripping their wrists together. "Hooyah," the post said in English.